What is a blower resistor? Blower resistors are resistors which are used to control the fan speed of automotive blowers. The fan speed can be changed either by switching the blower resistor resistance mechanically, using a rotating lever, or electronically by the air conditioning system. The change in resistance then limits the current through the motor, which dictates the speed at which the blower fan works. Blower resistors, being a mechanical component, are prone to wear and are the most common point of failure in a car’s heating system. This article will focus on mechanical blower resistors, their construction and troubleshooting. A blower fan is connected to the negative battery terminal (also called ground) on one end and to the positive battery terminal through a blower resistor on the other end. The blower resistor is connected in series with the blower fan. This means that the current running through the blower motor, and thus is speed is controlled by the resistor value. The user chooses a suitable fan speed by using a selector to connect one of the resistors in the blower resistor pack. Blower resistors are made of several resistors with different resistances. There are also two additional circuits used for the off state and the highest fan speed state. In the off state, the blower motor is disconnected from the power supply. 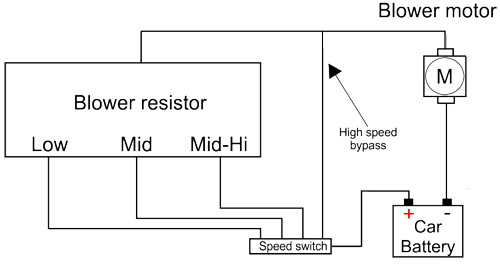 In the highest speed state, the blower resistor is bypassed completely and the fan is connected directly to the car’s battery, which allows maximum current through the motor. The lower the resistance of the selected resistor in a pack, the higher the current that flows through the blower fan, and the faster the fan will turn. The individual resistors inside the pack are usually wire wound and they may fail by burning out from use, and may also fail due to mechanical stresses and vibrations typically found in an automotive environment. When a blower resistor is faulty, the fan will usually operate at one speed only, usually the highest speed setting possible. Sometimes, only some of the speed settings will be faulty while others might work. Check the fuse for power on both ends using a multimeter. If there is power on one end of the blower fan fuse but not the other, then the fuse needs to be replaced. Check the fan relay, if the car is equipped with one. Such relays can be tested by placing a finger on them and switching the fan’s control on and off. Clicking from the relay is an indication that the relay is almost certainly working correctly. Check the fan itself for power presence by turning on the fan control and checking the fan itself for +12V at its terminals. To do this, switch your multimeter to voltage measuring mode and verify that the voltage difference between the fan’s terminals is 12V. If there is no power present at the fan, suspect a wiring fault. In this case, it’s best to take the car to a certified auto electrician. If power is present on the fan’s terminals and the fan is not working, the blower fan is defective. Find the blower resistor and detach it from the rest of the circuit. For the precise location, consult the repair manual for your car’s make and model. Some common locations are near the blower fan motor, under or behind the dashboard, around the passenger footwell etc. Once the resistor is located and detached, it is often possible to say whether the resistor has burned out or not judging by the physical appearance only. A burned out resistor should be replaced by the appropriate replacement from your car manufacturer. If the appearance is normal, it is necessary to measure the resistance across each individual resistor. The resistors are all connected to a common point. Switch the multimeter to the resistance measuring mode, attach one probe of the multimeter to the common point and use the other probe to measure resistances at other points. If any of these resistances show an open circuit (infinite resistance), then the blower resistor needs to be replaced. A word of caution: the blower resistor gets very hot during normal operation, so care must be taken to avoid burns and other injuries.